You know there are some places that make you feel so selfish that you almost wish that no one else knew about these places and that you could have the place all to yourself; well! Tamhini Ghats is one such place. 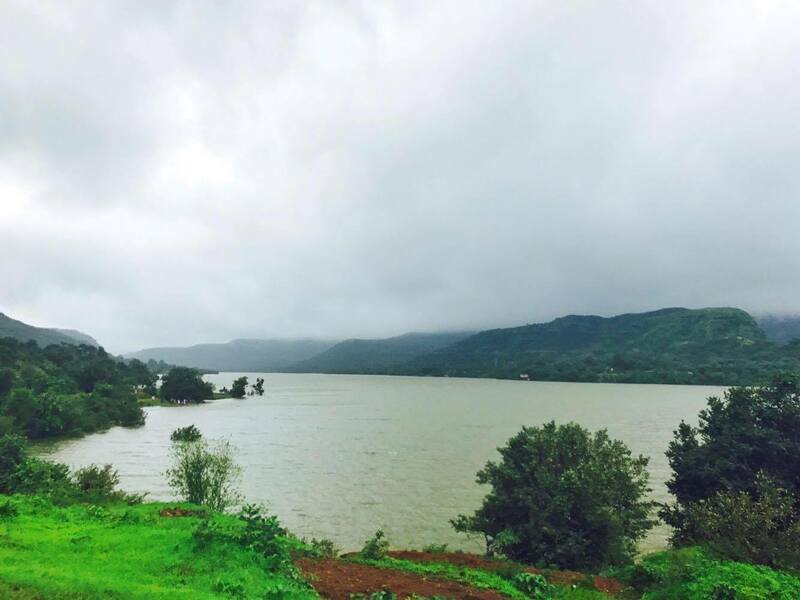 Although it has now become quite famous among people and on weekends specially you see so many people driving to Tamhini from Pune, but it is still better than going to Lavasa or Singhad. Mainly because it is not that crowded and a lot of people usually get stuck at Mulshi. If you want to admire the natural beauty and are up for a little adventure, this is the perfect trip to take on a weekend. Where is Tamhini Ghat & Getting there? Tamhini Ghat is a mountain pass between Mulshi and Tamhini and is a part of the western ghat mountain ranges. It is about 60 kms from Pune but the road condition is not very good after Mulshi, so it takes about 3 hours to reach Tamhini. So! The drive to Tamhini is really pretty and you will be mesmerized by the beauty around you. You might want to stop after every few minutes and take zillions of pictures. and the weather helps too! Cool breeze and a little drizzle at intervals feels amazing. 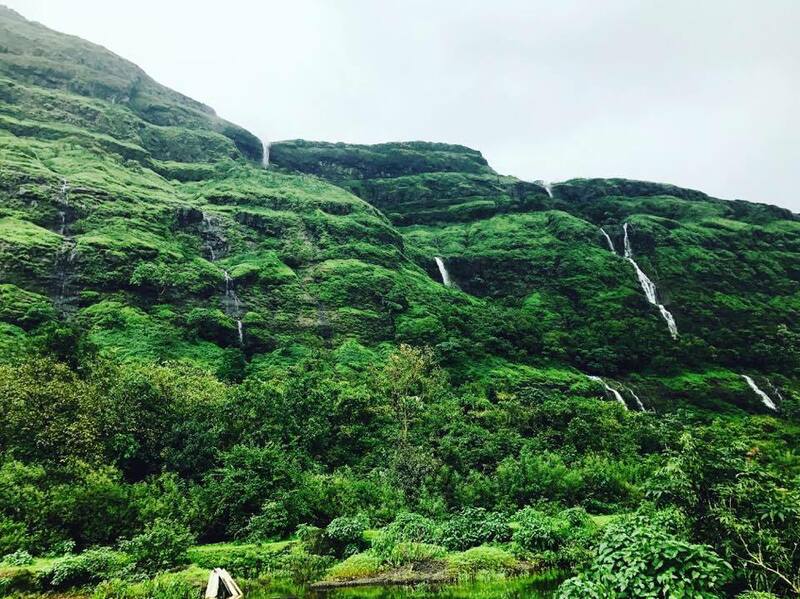 There are a number of big waterfalls and also, during the monsoons there are a number of new waterfalls that form naturally. But if you are going on a weekend, expect it to be really crowded. You will see a lot of waterfalls crammed with people and a lot of traffic near these waterfalls because there is no proper parking place & most of the people who park their cars on the road side are too excited to get in the waterfalls and they don’t see if their car is on the road! For the most part you will drive around Tamhini ghats, admiring the beauty of place. I was juts telling Nitin to see this view and that view because he was driving! 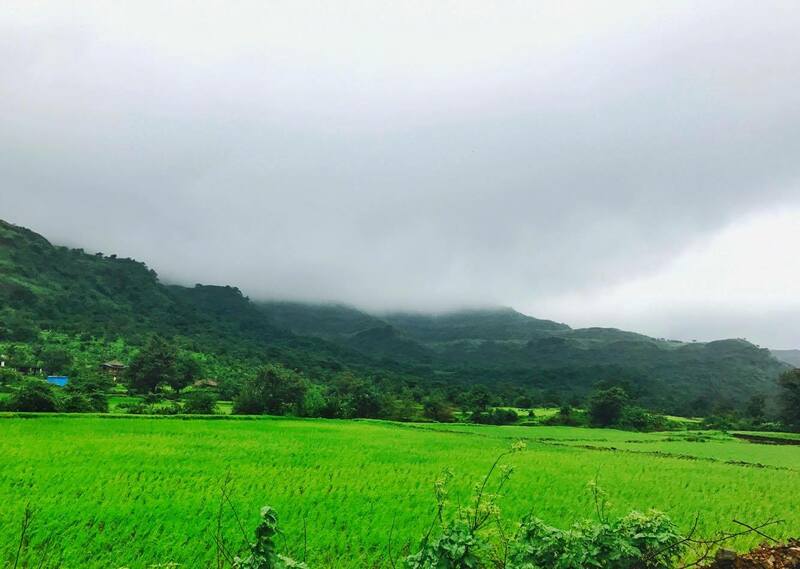 😀 On way to Mulshi you will come across several view points where there will be a lot of people and a number of corn vendors. The view from some of these view points is breathtaking! Drive through Tamhini ghats and go to Independence Point. Oh but yeah, load the location in your GPS early on because you might not get any signal once you reach Tamhini Ghat road. Pay the Rs. 50/- entrance fee and start the trek inside the forest. From there start walking in the direction of the last lamp post and you will see a number of waterfalls. But Don’t stop at the first few waterfalls because there will still be a lot of people there. But if you keep walking and exploring, you will eventually come across some pretty awesome waterfalls and almost no one around. You can have a little picnic there and just hangout with your friends/group. You can also go and Explore the famous Devkund waterfalls, but they are also quite crowded and are avoidable on weekends. It is better if you just explore the places around Tamhini ghat road. Next Post Life Threatening Deadlines !! !